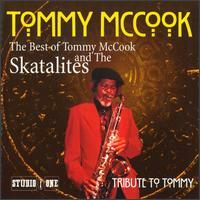 The best of Tommy McCook and The Skatalites. This has been worth waiting for, many tracks not previously available on cd and two tracks unreleased, including "Jazz Walking" produced by Duke Reid. Very nice booklet with extensive sleeve notes by Brian Keyo, a must for all Tommy McCook fans and Skatalites collector's. Heartbeat CD 11661-77162 USA.